19-03-2019, 14:46 - Wavs in msx2.org, how do I know how to load them? CRT -LO ? 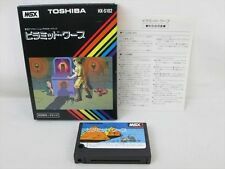 19-03-2019, 02:05 - Wavs in msx2.org, how do I know how to load them? CRT -LO ? 27-02-2019, 10:58 - "Tape end reached... stopping. You may need to enter another tape image..." ERROR, what to do? 27-02-2019, 04:26 - "Tape end reached... stopping. You may need to enter another tape image..." ERROR, what to do? 27-02-2019, 03:14 - "Tape end reached... stopping. You may need to enter another tape image..." ERROR, what to do? 21-02-2019, 05:19 - How to setup openMSX on Macbook, please help! 18-02-2019, 21:43 - How to setup openMSX on Macbook, please help!